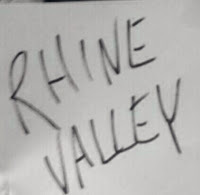 Tell The Truth is the debut song from the mysterious two piece Rhine Valley. They describe themselves as "Melody & Riddims. Explosive heavyweights" and reveal nothing else other than their names on their Facebook page. But one listen to Tell The Truth and the two dark mysterious playful one and three quarter minute snippets on their Soundcloud page and it's very quickly clear that they're going to be a force to be reckoned with. The song is a real melting pot of subtle influences fused together to make something that's quietly intoxicating and original in its own right. It doesn't attempt to make any grand statements, but its half-spoken, half-sung vocals and the way the song lifts and turns direction throughout do its bidding for it - it's as perfect for a hot summer day with its tinges of Californian surf as it is for a dark bedsit with its showering of angst-ridden self-analysis "I don't know what to do, because all I think of is you, so baby baby won't you tell me the truth." Rhine Valley are on Twitter, Facebook and Soundcloud.